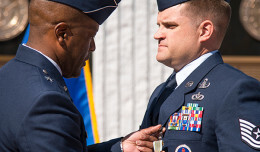 In a ceremony at Fort Hamilton, N.Y., Master Sgt. 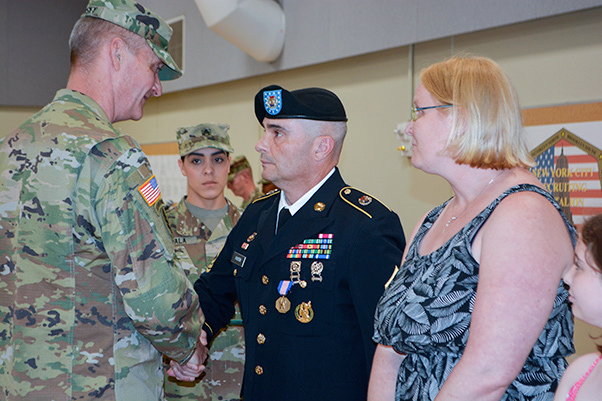 Michael Huson received the Soldier’s Medal on June 6, 2017, for his heroic actions in New Jersey last October. Initially, Huson assumed it was an old accident. It isn’t uncommon, he said, to see large vehicles pulled off to the side of the road. But this time, that wasn’t the case. 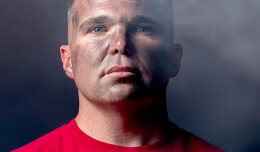 That’s when Huson decided he must apply what he had learned in the Army and act to help anyone who might be in danger. 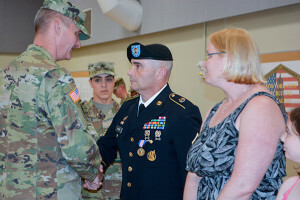 On June 6, in a ceremony at Fort Hamilton, N.Y., Huson received the Soldier’s Medal for his heroic actions on exit 57 that day. Huson said he understands the medal’s significance, and that Soldiers act with bravery all the time. Nevertheless, he said, he felt humbled to be recognized for his own efforts. Being the first on the scene, Huson jumped out of his vehicle and assessed the situation. The driver’s side of the truck was resting on the ground and two people were trapped inside. Gasoline was leaking from the passenger-side fuel tank, he said. Huson said he climbed onto the back of the vehicle and ran across the semitrailer to reach the vehicle’s cabin. Another person arrived on the scene around the same time. Huson handed the man his cellphone and asked him to call 911. “It was heavier than I thought it would be, so I had to put something into it,” Huson said. 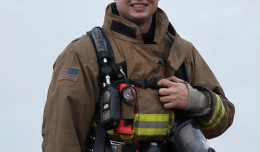 “When I heard the firetrucks … I was just thankful,” Huson said. For Huson, he proceeded through his work day with the same focus and calm he had used to rescue the truck’s passengers.